The Ohio State women’s hockey team finished out the regular season with a split series at North Dakota (14-14-6, 11-12-5-3 WCHA) Friday and Saturday. The Buckeyes won the first game 4-2 and lost the second 3-2. Sophomore forward Maddy Field had two goals in the victory. 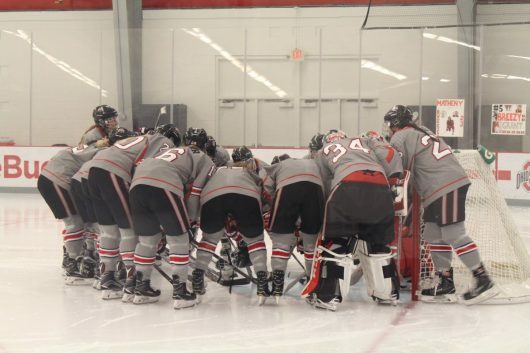 The Buckeyes ended the regular season 13-16-5 overall and 6-16-5-2 in the Western Collegiate Hockey Association. Buckeye redshirt sophomore goalie Kassidy Sauve, the current NCAA saves leader, had 58 saves for the weekend which was more than enough to put her in the Top 20 of the NCAA all-time single-season saves list. Sauve has 1,031 total saves so far this season, just 54 away from the current OSU single-season record holder. Field led the Buckeyes in scoring with three goals for the weekend, followed by sophomore defenseman Lauren Boyle with two, and freshman forward Samantha Bouley with one. On Friday night, Field scored an unassisted goal, the first of the game, at 3:53 in the first period. North Dakota answered with a shorthanded goal from sophomore forward Rebekah Kolstad just 42 seconds in the second period. Not a minute later, at 1:20, sophomore Lauren Boyle scored a power-play goal for the Buckeyes off of a pass from senior forward Katie Matheny. At 14:14 in the second, Bouley put one in the net thanks to an assist from redshirt freshman defenseman Jincy Dunne to put Ohio State up 3-1. Freshman forward Ryleigh Houston scored the final Fighting Hawks goal of the game at 3:38 in the third period to cut the OSU lead to 3-2. At 8:21 in the third, Field netted another off of a pass from junior defenseman Dani Sadek on the power play to seal the victory for the Buckeyes, 4-2. In the second game, North Dakota opened up scoring at 3:03 in the first with a goal from freshman forward Emma Nuutinen. The Buckeyes were shutout of the net in the first period, but scored three minutes into the second thanks to a goal from Field, her third of the weekend and 12th of the season. At 5:03, North Dakota’s senior forward Kayla Gardner scored to take the lead 2-1. Sophomore forward Charly Dahlquist of the Fighting Hawks put one in the net at 6:02 in the third. At 14:04 Boyle scored an unassisted goal on the power play to make the final score 3-2. Next weekend OSU will head back to Grand Forks, North Dakota, for the first round of the WCHA tournament. The Hawks and Buckeyes will play a best-of-three series. The winner moves on to play for a conference championship in the WCHA Final Face-Off.